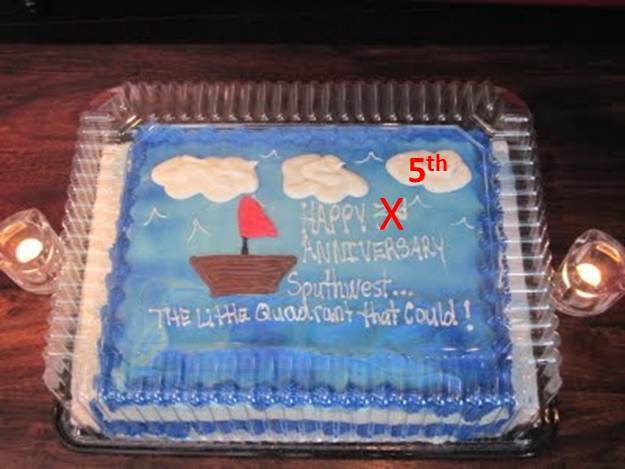 Southwest...The Little Quadrant That Could: Happy 5th Anniversary! 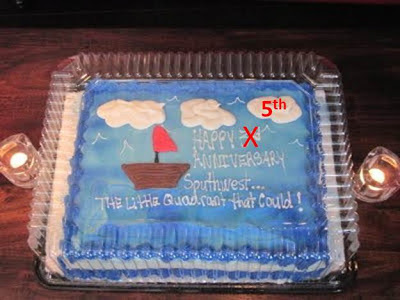 Today marks the fifth anniversary of Southwest...The Little Quadrant That Could. Five years ago today, I wrote my first post, which talked about the disposition of two parcels owned by the District government - one at the corner of 4th & E streets and the other at the site of Engine 13 at 6th and E streets. The District wants the chosen development team to build a new firehouse at the 4th & E streets parcel with commercial development above it. Five years and 783 posts later, a lot of development has occurred in the neighborhood, including a new Safeway, CVS, restaurants, and commercial development along a reopened 4th Street at Waterfront Station; the expansion of Arena Stage; new and refurbished office buildings near and at L'Enfant Plaza; a new Consolidated Forensic Laboratory; a new first district police station; a refurbished Amidon-Bowen Elementary School; a temporary stadium for the Washington Kastles; Camden South Capitol apartments across the street from Nationals Park; Sky House apartments at Waterfront Station; and condo conversions at Potomac Place Tower and Waterfront Tower. New Safeway at Waterfront Station. Other development is imminent. The Wharf, the largest development project coming to Southwest, is expected to start construction later this year once an equity partner is lined up and building permits are obtained. A new playground at the park next to the Southwest Library will be built this summer along with a dog park and community garden at Lansburgh Park. A Southwest BID may be formed as soon as this fall. Construction may begin next year on a new apartment building and a rebuilt St. Matthew's Church on M Street. Planned Unit Developments are active for residential buildings at Town Center and Waterfront Station. 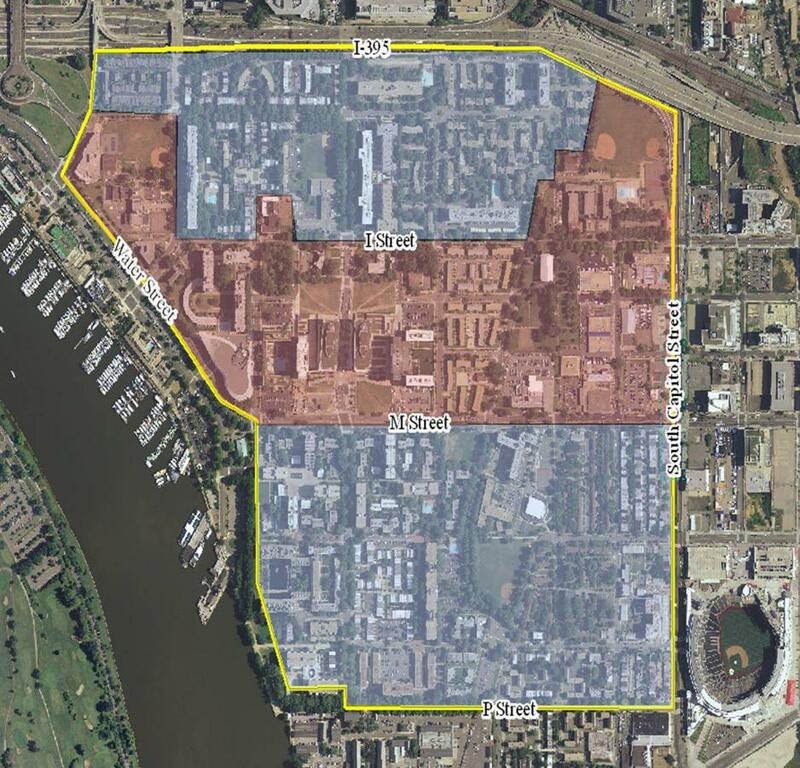 In addition, a deal is expected potentially within the next year for a new stadium for DC United at Buzzard Point. 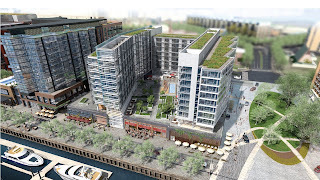 SmithGroup JJR rendering of Parcel 5 at The Wharf. Several plans and studies have been conducted for the area over the years. Those include the Southwest Ecodistrict Initiative; the M Street Transportation Plan; the Planning Assistant Team plan for Buzzard Point; the Maryland Avenue Small Area Plan; and the SW Small Area Plan is getting underway. Office of Planning map of boundaries of the SW Small Area Plan. Meanwhile, those two parcels that were the subject of my very first post remain unbuilt. E Street Development won the bid to develop the two parcels back in 2009, but construction has yet to begin. It was reported earlier this year that plans for phase one changed from an office building to a hotel and construction would start this spring. That start date has since been pushed back again by a few months. An announcement of which hotel brand is coming to the project should be forthcoming soon. WDG design of the planned hotel with Engine 13 firehouse. Needless to say it's been a busy five years in the Little Quadrant That Could...stay tuned! daily reader. don't know where I'd be w/o ur posts. every new one is like a present! keep at it n thanx 4 everything!! here's to the next 5 being better than the last!! Happy Fifth! Here's to another year of growth and development! this blog is great and one of the main reasons I ended up moving to southwest. i feel like there is always something exciting to read and its at the top of my rss feed. keep it coming and thanks for keeping us loyal readers informed! to another five! you're one of the good guys. neighborhood focused to the core! Happy anniversary! The news and updates you provide are very much appreciated! Thank you so much. Congrats on 5 years! One question though, is there any risk of the whole Wharf redevelopment falling through and not being done at all? I thought they were suppose to get started this spring, but now I read later this year when an equity partner is lined up? Thanks to everyone for the well wishes. To answer Rafael's question, I hear that there are a few potential equity partners that are interested in investing in The Wharf and the development team is close to deciding who they will select. Once they make a decision, the selected partner(s) will have a due diligence period of a few months after which construction can begin. My guess is a groundbreaking will happen this fall. Anyone interested in guessing the date it will happen? Late August-early September. This is Phase 1, correct? 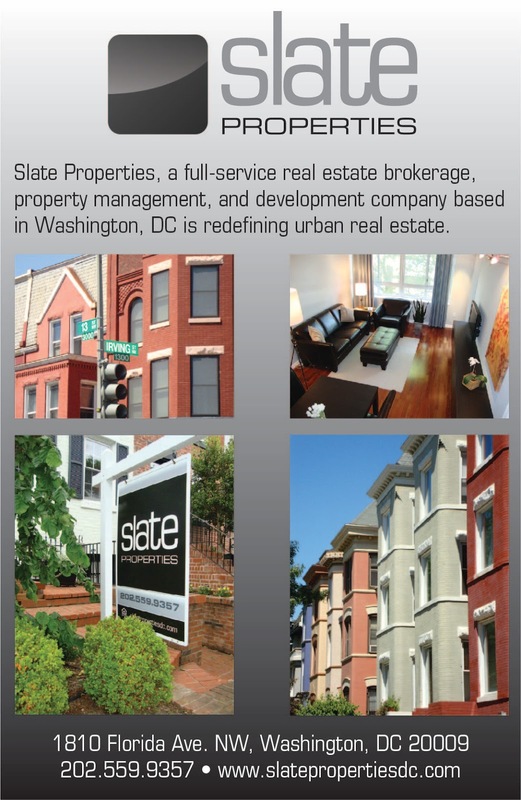 Which entails the hotel, condos and apartments? Phase one, which includes 3 hotels, condos, apartments, Wharf Center, piers, parks, and part of the Wharf promenade. Happy 5th Anniversary, and thanks for all you do for our little quadrant!